In Saturday’s UFC FIGHT PASS featured bout at T-Mobile Arena, rising star Lorenz Larkin likely crashed the top ten at 170 pounds with a blistering first-round finish of No. 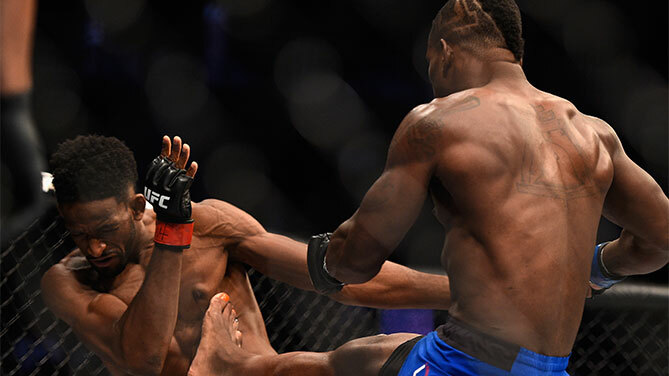 7-ranked Neil Magny, snapping Magny’s three-fight winning streak in the process. Larkin’s kicks to the body and leg battered Magny in the first three minutes of round one, opening up the Coloradan for the punches of “The Monsoon.” Soon, Magny was limping and grimacing after every shot to his left leg, forcing him to desperately look for a takedown. And when he did, Larkin tagged him with a series of elbows that ended the bout, referee Dan Miragliotta stepping in at the 4:08 mark. With the win, Riverside, California’s Larkin moves to 18-5 with 1 NC; Denver’s Magny drops to 18-6. 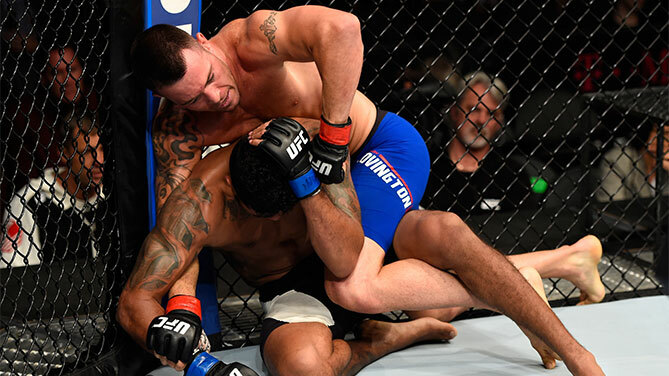 Griffin (12-3) was competitive in the first round of his UFC career, but he was mainly playing defense, as Covington grounded him and fired off bombs from the top position as he looked for the opportunity to set up an arm triangle. Covington (10-1) dodged Griffin’s strikes as round two opened, and then it was back to the mat, with “Chaos” remaining in control. With three minutes left, Covington got into the mount position and opened up a cut on Griffin’s forehead, but “Pain” was able to escape and briefly find some daylight. It didn’t last long though, as Covington went back to work with a relentless attack that lasted until the horn. 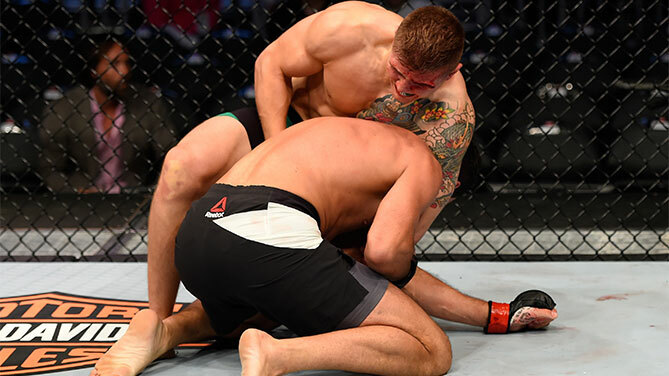 It was more of the same in the final round, and with Covington continuing to press the action with no return fire from Griffin, referee Mark Smith decided that he had seen enough, stopping the bout at 2:18 of round three. Italy’s Marvin Vettori got a win in his UFC debut, smoothly finishing Brazil’s Alberto Uda in the first round of their middleweight opener. Put on his back early by Uda, Vettori stayed cool under pressure and reversed position on the mat, and despite getting cut over the left eye by an elbow, Vettori kept working his ground-and-pound until he was able to sink in the head and arm guillotine that forced Uda to tap out at the 4:30 mark of the opening frame. Mezzocorona’s Vettori moves to 11-2 with the win; Santa Catarina’s Uda falls to 9-2.